A video that was inspired by @Johnwink90 ‘s 136 character tweet. On Saturday, July 18, I participated in #satchat. I had some time while the kids were playing Plants versus Zombies (the “Cowper Game App of the Summer!”). I had a coffee and my partner was reading beside me. I figured….why not. The topic of the day was “Back to School” and leading us was @DCulberhouse. I knew that the majority of the educators were West Coasties and I was interested in their take on Back to School. Of course there were many other participants from all over North America. Until the spammers got ahold of the hashtag things were going great. Of course the infiltration of spammers has nothing to do with the good people leading or participating in #satchat. On the contrary. The fact that we were trending a topic on a Saturday morning across the continent (and warranted the most inappropriate spam) speaks volumes about the quality of the 140 character content. The best learning for me happens when the conversation takes off and doesn’t necessarily stay in the social media. I like following the links – take me to news reports, research, forums, wikis, and blogs where the meaty stuff resides. You don’t get the full monty 140 characters at a time but like the library card catalogue, it should be there to tease and inform you about where the good stuff is. After reading @dougpete’s blog entry and considering many conversations with incredible learning leaders like @kellypower and @globeandtims I continue to rehash the essential question: Is Twitter a Professional Learning tool? I participated in the chat on Saturday with a group of like-minded educators passionate about learning and opening the school year (from all over North America). I learned of a myriad of ways other leaders are handling logistical issues that are ever-present in the first weeks of school. I grabbed a few nuggets of wisdom that resonated with me. I learned of many ideas, best practises and innovations for having a successful Back to School Night. 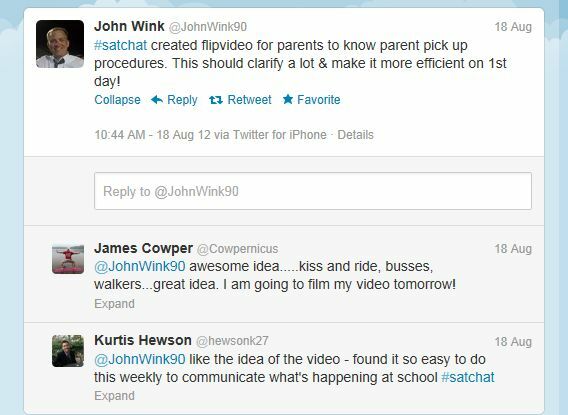 I learned of one Principal (@JohnWink90) making “How To” videos for his parents and community. I made the committment to “give it a go” (thanks for the lingo @jessmcculloch) myself with an iPad, iMovie and our Eastwood Eagles YouTube account. I filmed the entire video using my own children and a few adult helpers as “actors” on the very same day. I also sent the video to two Vice Principals in my district for their perspective and assistance. This endeavour involved professionals, learning, technology tools, acting (doing) and reflecting. I will undoubtedly get feedback from the community, other school leaders and the kids. Granted there is not a direct impact on student achievement. I still believe firmly that the reason I engaged in the entire process was because I am a member of an ever-expanding professional learning network through Twitter. Again, in this instance the power of social media lead to deeper learning experiences. For me Twitter has not been the best professional learning I have ever engaged in. I believe that saying this is hyperbole. On the contrary I have had some incredibly moving learning experiences with one, two or three people in a room making dialogue over work, learning, dilemmas or successes of our profession. These are the professional learning experiences that have been the most riveting and influential. Funny thing is. . . without Twitter I may not have had the opportunity to have these conversations with the likes of those mentioned above (not to mention the 34 #UnPlugd12 -ers from last weekend!). Twitter has turned me on to some individuals who have led me to question, bolster, appreciate, act on and essentially change my perspective on just about everything I have learned to this point. Thanks good sir. I hope it helps our school community this September. I am going to have some fun filming a trailer for this academic year next!